our Early Access program to bring faster speeds to businesses in our Fiber cities. Since then, we’ve been inspired by what these businesses have been able to do. From a media company that now conducts virtual jam sessions to a coffee house that livestreams their community events, we’ve seen many unlock new possibilities with a speedy, reliable connection. At the same time, we know that businesses come in different shapes and sizes. They have varying needs and would like the flexibility to choose a plan that best fits their needs. That’s why we’re transitioning from the Early Access program and introducing three new plans. Small businesses in all of our Fiber cities will now be able to pick from speeds ranging from 100 Mbps to 1000 Mbps. We’ve also increased the number of static IP addresses available to a business—up to 13. And we continue to be committed to providing fast, reliable service tailored to the needs of small businesses. Our support team is available to help 24 hours a day, 7 days a week. Eligible small businesses in Charlotte can now sign up for one of our new plans. Businesses everywhere can check their address and join our list to be among the first to know when we’re available in their area. Eligible small businesses in Kansas City, Provo, Austin, and Nashville will have until July 31st to sign up under the Early Access program. Beginning August 1, 2016, they’ll be able to choose from one of our new plans or keep their Early Access plan and pricing for a full year. We can’t wait to see what small businesses will do next with superfast Internet. We’ve always believed that small businesses can do big things with superfast Internet. In 2014, we launched our Early Access program to bring faster speeds to businesses in our Fiber cities. Since then, we’ve been inspired by what these businesses have been able to do. From a media company that now conducts virtual jam sessions to a coffee house that livestreams their community events, we’ve seen many unlock new possibilities with a speedy, reliable connection. our plans to come to Charlotte, residents and businesses across the city have embraced the possibilities of high-speed, abundant connectivity. Charlotte is already a hub for business and ingenuity—and superfast Internet has the potential to unlock a new chapter of innovation across the Queen City. Today, we’re launching sign-ups for residents and businesses in Charlotte, starting in the Highland Creek neighborhood. Residents in Highland Creek will be able to sign up for one of three plans: Fiber 1000 + TV, Fiber 1000, and Fiber 100, with the option to add Fiber Phone to any plan. Eligible small businesses can sign up for one of three new business offerings, available for the first time in any city. And all Charlotteans can join us at the newly-opened Charlotte Fiber Space at in the historic Philip Carey Building to take Google Fiber Internet and TV for a spin. It will take time, but we’re working hard to bring Fiber to as many neighborhoods as possible in Charlotte. We’ll be opening new neighborhoods for signups as we complete network construction in those areas. Keep in mind, residents will have a limited amount of time to sign up—this helps us to focus resources before we move on the next area. You can track progress for all areas on our website. And if you live in an apartment building, check out our Apartment Finder to see if your building on track to get Fiber. 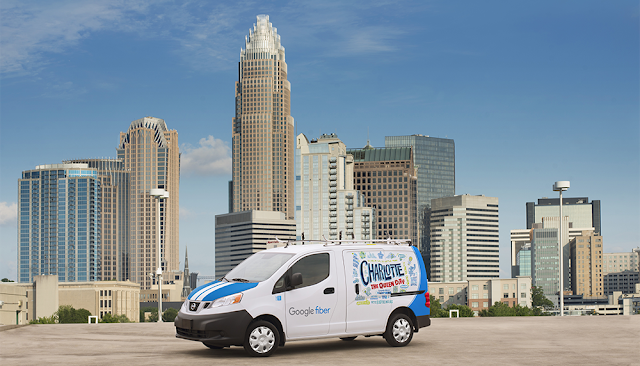 As we connect Charlotte to Google Fiber, we’re also working to bring faster speeds to families who may not be online today. We’ll be introducing a Broadband plan that offers 25 Mbps for $15 a month to some of the most digitally divided areas that we serve, determined using data from the U.S. Census and Federal Communications Commission. We'll also be offering gigabit Internet at no cost to residents in select public and affordable housing buildings. These programs will build on existing investments, like our support of digital inclusion fellows at the Urban League, Charlotte Mecklenburg Housing Partnership, and the Charlotte Mecklenburg Library. From Charlotte’s emerging startups to families at home, our goal is to provide abundant access to all of Charlotte—we’re just getting started. From the day we announced our plans to come to Charlotte, residents and businesses across the city have embraced the possibilities of high-speed, abundant connectivity. Charlotte is already a hub for business and ingenuity—and superfast Internet has the potential to unlock a new chapter of innovation across the Queen City.